Men's magnetic medical ID bracelet. 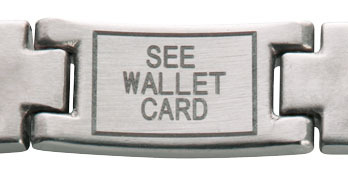 See Wallet Card is engraved on back on the inside of the bracelet, behind the medical alert symbol. This bracelet has a classic polished stainless steel finish and sporty design, making it a favorite for men! The bracelet is approximately 7/16 inches wide. Sabona manufactures and markets fine copper and magnetic bracelets worldwide. IMPORTANT Do not use magnet products during pregnancy, or if you have an electrical implant such as a pacemaker. Consult with your doctor if you have any questions and continue with regular medical care. Magnetic products should not be worn next to a watch. Various forms of copper have been used for medicinal purposes throughout the history of mankind. Today, as more information becomes available, alternative health care and home remedies are gaining popularity. To learn more, read our blog: Sabona Magnetic and Copper Bracelets. Great product, will buy from seller again. Excellent seller and fast shipper. I highly recommend! Very nice bracelet... it is as good as it looks, very hard to find a product like this in the UK. Excellent service could not be better, it was a pleasure to deal with despite the distance. Would certainly recommend.